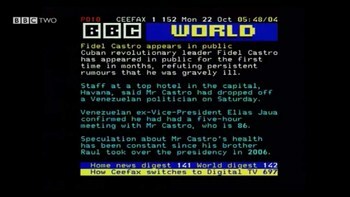 A screencap of BBC's Ceefax service from October 2012, right before the end . A screencap of BBC's Red Button Digital Teletext service as of June 2017, which replaced Ceefax after analog cutoff. While Analog Teletext used the ability to overlay itself over broadcast video sparingly, Digital Teletext absolutely abuses that ability. One of the coolest things on your TV before digital set-top boxes, on-demand movies and Freeview. Teletext is basically a continuously updated news feed transmitted through your TV (in gaps in the signal), developed in the United Kingdom in the 1970s and being used worldwide. Most notable for its limited number of characters, the general BBC Micro-ish look of the thing note which it came by honestly; Teletext pages were created using one and the fact that you'd at times have to wait for several pages to load, Teletext doesn't crash under heavy user demandnote However, if you have poor television reception, the service may be tenuous to use- the readability of the service correlates directly with how clear your TV reception is, and not having a good reception results in garbled or missing text, if anything comes up at all.. Before the Internet, this was the way you got the footy scores note Or if you're in Singapore, Malaysia and Hong Kong, stock market information and lottery results. Memorably described as a pound-shop version of the Internet. Pages have individual numbers, which can get memorable. 888 is the UK code to get Closed Captioning. Interactivity however, was limited to a minimum. Typically, only the first 800 pages are used normally, anything above page 800 was reserved for special services like captioning or real-time pop-up displays during special events. Due to teletext's broadcast-only nature, interactivity involves a "Show" button (essentially technology similar to the spoilers tag used here on TVTropes, except that it's triggered through a button on your TV remote), "Choose-your-adventure" style page-flipping, or on more advanced systems used in some European countries, calling a number on your phone (although the outcome of your choice is visible to everyone using the service). On most services, one can also get the time and channel name from Teletext; several TV sets from Sony sold in Europe and Asia could display the channel name under the channel number if Teletext was transmitted on the channel; additionally a button on the remote could bring up the current time and date for several seconds. Teletext Limited, the company responsible for the ITV and Channel Four services, had a handful of other businesses, including a holiday shop TV channel, which will remain open—and oddly, continue to use the Teletext brand. There was also an attempt to launch Teletext in Japan, with the service called Moji2 (pronounced Moji-moji). The system appeared to be an enhanced version of NABTS as it provided Japanese characters support in addition to the graphics mode NABTS was famous for. The fact that the west hears so little about it meant that the service most likely flopped, in a strange case where useful technology actually failed to take off in the country. In the late 90s, an updated version of Teletext was introduced. Called Hi-Text, it finally caught up with the NABTS and Moji2 systems in that it offered a higher resolution display and vector graphics support. However, the system faced stiff competition from the Internet and waning interests in teletext technology, and thus was only adopted by several North European countries. Side note: Teletext never really died, it just evolved. The successor to Teletext is made out of several digital text standards (mostly DVB-TXT, DVB being the digital standard that replaced PAL and SECAM which were used in countries where Teletext was popular, and MHEG-5, the markup language used to design a digital teletext page). As TV becomes increasingly digital, these services moved to a richer-experience albeit less enjoyable digital format, if not discontinued outright. ITV, Channel 4 and Channel Five ended their service on December 15, 2009, more than two years before the analogue cutoff. However, the digital format is still in use in several Northern European countries as well as in Australia and Hong Kong. Likewise, Ceefax was reincarnated as Red Button when converted to it's Digital Teletext form, named after the button on the remote that brings up the service. Ceefax (pronounced "See Facts") for The BBC, which ran from 1974 to 2012 - surviving until the last analogue transmitter was switched over to digital broadcasting. In reality, it had reincarnated into the Red Button service after 2012. ITV, Channel 4 and Channel Five's Teletext, which ran from 1993 to (essentially) 2009. Which replaced the older ORACLE system, which ran from 1978 to 1992. And was home to Digitiser. Ireland's main teletext service is Aertel, which has survived the switch from analogue to digital broadcasting—just. Major Polish television stations still use this, but this gets little love from the production team.note Most of the things you find there, other than news and (in some stations) closed captioning, revolves around hookup offers. At least it survived the switch to digital and is still active as of June 2018! Singapore has the SBC (later TCS, then MediaCorp) Teletext service, which was revered by stock market players as it provided extremely up-to-date information about the Straits Times Index(the stock exchange of Singapore), even faster than the Internet could. This alone ensured the service stayed up long after neighboring Malaysia had shut off their Teletext transmission and was only discontinued after the first phase of analog shut down, in mid-2014. As mentioned above, Neighboring Malaysia also had it's own Teletext service under the name of Beriteks (a combination of the Malay word for news and text). The service started in 1985, but was eventually shut down due to the Mahathir government's emphasis on the Internet in the late 90s and early 2000s. The government-owned RTM channels stopped transmitting Teletext in the early 2000s, and Media Prima shut theirs off in 2008.